You can’t go much further underground without calling diggers hotline, than the two ravens together know as the The Naima. A metal band playing to jazz principles can hardly be stopped, or seen. They’ll drop a super limited edition SD release this Sunday at Circle-A. Supposedly there’s some crazy videos and other lo-tech stuff to distract you from their super ripping tunes, like this mysterious transmission that ended up on The Portuguese SoundCloud. The Naima will be setting clocks forward at Circle-A’s Live at 8 with The Nobody Brothers this Sunday January 26, 2014 at 8p. The Naima is not to be confused with Naima Adedapo or The Naima Train, so you don’t have to push your jacket sleeves up in the bitter cold or bring a mini-backpack. Actually, you probably shouldn’t search The Naima much on the internet because basically the internet avoids the The Naima. Burrowing deep in a crease at an uncharted pole of your being, resonating frequencies in rare, often musty air; an entity bearing the mark of Rock music, Secret Lover arrives. They cruise well after the nostalgia that has many clamoring for simple times found in early century blues roots. They dig far beneath concrete foundations, burying acoustic beat era folk in its shallow grave. They leave soundtracks of peace and protest at a forgotten rally with hand written signs. They’re really not known to break things that aren’t theirs, so they don’t need spikes. They crimp midi cables and corrupt the digital interfaces hiding music hackery. They rewind self-loathing, and close the dairy. They care about what they do, their cool falls secondary, so collars down. Born before Moog was normal, they relish lo-fi. They hid in a shoe box until destiny knocked them off a dusty shelf. They ended up in a cassette tape deck, stellar-as-ever, post-punk, art-core and beyond. Rolling a new EP release, The Lasso, right at the end of 2013 Secret Lover has stolen the year, giving amplified instruments renewed purpose. Back in Milwaukee a year and half after testing their Summer Demo on a few willing heads, they recently meandered back to a small venue in Riverwest to kick off 2014. Lyrics rarely carry entire albums so resolutely both in content and vocal quality, and there Sally Horowitz exudes everything that now means. Controlling the mood and moments in every song with her voice, she celebrates micro-drama paradigms and self-determined sensibilities, soaking them in perpetually shifting meter and tempo, unpredictable melodies and soul-snatching contralto octave switches; punctuating stanzas with an occasional evocative spoken “Oh Yeah”. And the band has the tab covered. Lead guitar John Guida divides himself on most songs between rhythm and solo parts, distortion and hollow pickups, like a man with no palms, and a third brain hemisphere. He’s the docent for The Lasso, quietly guiding ruddy ears on an indie journey, propelling Secret Lover’s purposefully crude product, substantiated by highly technical methods, to the moon. Sewing the void left between vocals and lead, Lars Paulson pulsates sticky rhythmic effluvia on bass, following structure momentarily before dribbling spontaneous scales with nice handle, subtly giving the final outline to the emotional tones held in the jams, shaking stable feelings from their tree. Noticeably beefing up the percussion from their initial 2012 release, Summer Demo, Dave Paquette hammers his kit, a contained riot determined to knock down an inhibition or two, pace-setting each song fluidly, throttling and coasting with his mates. Serve the whole ensemble with room temperature Hamm’s, and you’re basically set. Taste Dorian to sample Secret Lover’s choice of ingredients. Presumably an ode to a friend, lighthearted and heartfelt, Horowitz dives in plainly, coyly, “Dorian you changed your name, and you cut off all curls…” The band rides right in, as Horowitz continues through though the chorus and bridge, each take their turn embellishing a verse with a slight variation. The song builds to the refrain with Paquette rolling, Guida veering off to a half scale, and Paulson syncopating nastily, by the close a climax is reached in deep in harmony, a simple exercise in bliss. Infectious, present and packing some serious performative powers Secret Lover resuscitates and revives those dark and mundane places that harbor rough beauty. Where a lot of music tries really hard to be something, they just are something, and they’re evolving rapidly. Secret Lover is touring, so if you’re not killing baby red pandas you should check them out. The Lasso is a 6-track EP available for download, and so is equally worthy Summer Demo. Passers-by on the Riverwalk crossing at Wells Street, squint their gaze at the brownish human figure standing at ease, with arms bent at both elbows to let the most famous thumbs in history point to the sky. Everything’s Hey, OK.
For statues with notorious local reputations, the Bronze Fonze stands next to only the random Michael Jackson idol that was stuck in mid-pelvis thrust out side of Fulham FC’s stadium at Craven Cottage, London. Let’s face it, Fonze in the Happy Days… butter, today the Bronzie attracts its share of ridicule. On one seemingly normal overcast morning, lurking an uncomfortable distance from the Fronze, another statue suddenly appeared. A seven-foot gangly clay figure glowered over the Fonze, disproportionately large hands’ pleading palms inward facing to its chest. It wore a blue suit. It stood on massive black booted feet. Someone had taken the ante up a notch higher than ever before. Apparently, as the day went on people started to notice; as public art projects tend to be a hot button topic in this town. Having one appear in such a prominent location, with no public hearing, must have raised someone’s eyebrows. A day later, Jim Stingl, known for scrounging up a scoop to post on JSOnline, sent out a plea on NewsWatch to get a bead on the goings on. Amazingly that yielded results in less than 24-hours. Turns out a local artist The Skrauss, a recent MFA of UW-Milwaukee and long-time illustrator, has unmistakeable work. Jim Stingl somehow got a hold of Skrauss and pulled a few strained responses from him. A mysterious statue on the Riverwalk, makes a physical metaphor for random acts of love and outburst. I suppose with a sketchy box van and 10-foot statue, pop-up public art is possible. The Skrauss has art that hangs on walls too, and sometimes cameos in indie films like The Wheel. Usually the debate about how to get about town in Milwaukee is a decent conversation piece. In the worst cases, it’s the way to find the poles of people’s outlook on life in the city. Wait what’s that? Milwaukee has Zipcar! Now there is even more to talk about, and they’re giving away a Zipcertificate worth $100 to get a worthy Milwaukeean moving (details below). As Milwaukee tussles with plowing towards becoming full fledged metropolis or remaining a fragmented mid-sized city of suburbs and enclaves, many urbanists vie for a more robust public transit system by adding variety to available modes. From buses, street cars, to bike shares multiple transportation options decrease reliance on cars and increase urban viability as a matter of public policy. Urban Milwaukee, has provided an ongoing commentary on the Downtown Street Car plan and other transit innovations that have made their way through the wringer a few times, some set to see the pavement in 2014. Other Milwaukeeans make a conscientious lifestyle or personal finance choice to live car-less relying on any of the above, and in certain fits of principled defiance (read: “fun”) take “pedicabs” and pedal pubs. Others who come to the city from smaller towns, or who are just prideful locals, may swear by nothing other than a personal vehicle for transportation, lest they have their own personal Jim Anchower moment on the bus. It’s quite possible that with Zipcar, Milwaukeeans can now travel the middle ground about town when and how they choose. Zipcar is a car sharing business that has served Milwaukee for the past five years. This University of Wisconsin-Milwaukee campus got them first in 2007, and soon after Marquette University added the Zipcar option. This past August, Zipcar expanded its presence in Milwaukee to serve nearly 20 locations. Zipcar works like a monthly subscription to awesome cars that you can use by the day or hour, accessible right in your neighborhood. What about insurance? It’s included. What about gas? It’s included, if you follow the very reasonable guidelines. What about the hassle, sounds like a rental car? Leave that to the concierge at the airport, with the deposits, and mandatory rental periods and every changing pricing. You sign up for Zipcar and use the mobile web (iOS or Android) or conventional internet to make a reservation 24 hours a day, 7 days a week. Modern technology allows you to access the car and drive off without having to talk to a person. Even in an middle of the night emergency you can get to where you have to go, as long as it’s not to Kalamazoo. Have you a friend that’s coming in town on the Hiyawatha or by coach bus from a city like Minneapolis or Chicago that has Zipcar? Say on an occasion your schedules don’t match. If they are signed up they can arrange a Zipcar here, they can explore Milwaukee for an afternoon until you can connect. If you live around downtown Zipcars are stashed about several neighborhoods for your shopping, business, or personal convenience. Juneau Town on Kilbourn and Van Buren, Eastown on Jefferson and Wisconsin, US Bank Center on Michigan and Cass, Public Market on Broadway and Clybourn, Third Ward at Buffalo and Jefferson all have Zipcars. Some people need car for an afternoon once or twice a month, why go $15,000 in debt or get a hooptie that’s going to break down when you need it. For many people, Zipcar is a practical way to save money and abide by a low-car diet. You’ll probably be able to enjoy the luxuries of a much nicer car that you can afford while you’re at it. You’re a responsible adult, so why shouldn’t you be able to drive an Audi Q5, Mini Cooper or Toyota Prius? To Zipcar affordable does not mean economy. Each of these cars are available in the Milwaukee market in select locations. Other Zipcar makes include Mazda, Ford and Hyundai. Using Zipcar doesn’t mean you have sold out public transit. Zipcar represents the shared option, which is the next most civil thing to the public option, without the nerve racking of lending or borrowing and bumming rides in someone else’s car. Matter of fact, it’s basically like a bike share but with cars. Well almost. Although our wildest dreams as kids were to put some coins in the kiddy horsey ride and ride off, you’ll actually have to sign up and get your Zip Card in the mail before using Zipcar. Services like Zipcar are huge steps in the right direction and show the surge in vitality Milwaukee has recently experienced in its city center, so it’s at least worth knowing about. RadioMilwaukee has a spot with Zipcar’s Milwaukee marketing rep, and she’s got a great radio voice you can hear behind the “Love’s Gonna Get Ya”/”Plug Tuning” and “So Watcha Saying”/”Jackin’ for Beats” instrumentals. To make their 2014 expansion a little more fun, the good people at Zipcar have decided to offer one lucky Milwaukeean, and Local Trolley reader, a $100 Zipcertificate to put towards a Zipcar membership and driving credit, and the folks at Local Trolley are honored to do the honors. To get a shot at starting your low-car diet on the house, “Like” Local Trolley’s Facebook page by January 15, 2014 to cast your lot. I used to have this awfully bad attitude like most teens, especially toward popular media, and for some reason it extended to books of literature. I used to rant about how anyone could just start writing, making up any old thoughts and pass them off as facts or novels. Around this time, this newspaper started appearing in the halls of my high school. It was filled with all sorts of non-sense like Air Jesus coming back to earth dunking in a Bulls jersey, commentary written under the pseudonyms like Smooth B, Jim Anchower and Higalec of the Healfdanes, and some classic spots like Point/Counter Point. It was foundational material emulate, fertilizer for a generation of native Milwaukeeans with a natural penchant for imaginative banter and hyperbolic heckling coursing through their veins. Milwaukee is of course the ancestral home of Jim Abrahams, Jerry and David Zucker, could anyone expect less. One day buried, on page 5 or something, a random throw away column appeared, “New Study: Books Don’t Take You Anywhere”. In disbelief, my eyes swirled in a self-righteously justified tizzy at the mundane black and white picture of a 9 year old sitting in an over sized living room easy chair reading a book. That was the moment the The Onion played my chord, I was hooked. At year close Milwaukee abruptly lost a dear smelly old friend. The day it was announced that The Onion print edition was going away should grudgingly join that club of infamous, tragic and otherwise note worthy moments in popular history deserving of a “where were you when…” recollections. It was almost two months ago now when I first heard the news and I’ve already almost forgotten mine. I’m pretty sure I saw a status come through the A.V. Club Milwaukee page and immediately dismissed it as “usual antics”. About a week later, I was driving down Prospect Avenue while texting and listening to The Disclaimer on WMSE, which included then A.V. Club Milwaukee editor Matt Wild, where the gory details were revealed. Somewhere along the line, some bastards in Chicago thought Milwaukee shouldn’t have a newspaper it helped bring to national prominence over the previous quarter century, circulating weekly on newsstands with the admirable A.V. Club Milwaukee local insert neatly tucked inside. It figures, we also have more bars per capita than Chicago, and naturally more cool stuff going on per capita too. 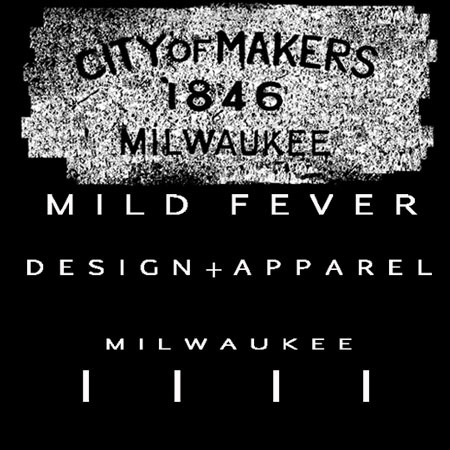 According to Wild , the Milwaukee outfit was still profitable, albeit likely on the curvy mounds about the ladies and gents in the Silk and chatline ads, profitable non-the-less (not a directly attributable sentiment of Wild). It is unknown if the same could be said in Madison, Boulder or any other of the cities The Onion phenomenon burrowed underground, later to be snatched up and tossed at a skateboarder. Let us then remember The Onion as a true beacon of the oft’ hidden reality found in the sarcasm of cynical minds. A life line for the consciousness of free and critical thinkers to cling, a boil on the face of overcooked established journalism. The Onion: a testament to the vast potential contained in the sprig of an idea. To the A.V Club Milwaukee, a persistent tap on the side of the head to remind us that the local voice matters, and that their is always a reason to slug some Lakefront pints with your esteemed colleagues in the Onion Beer Society. 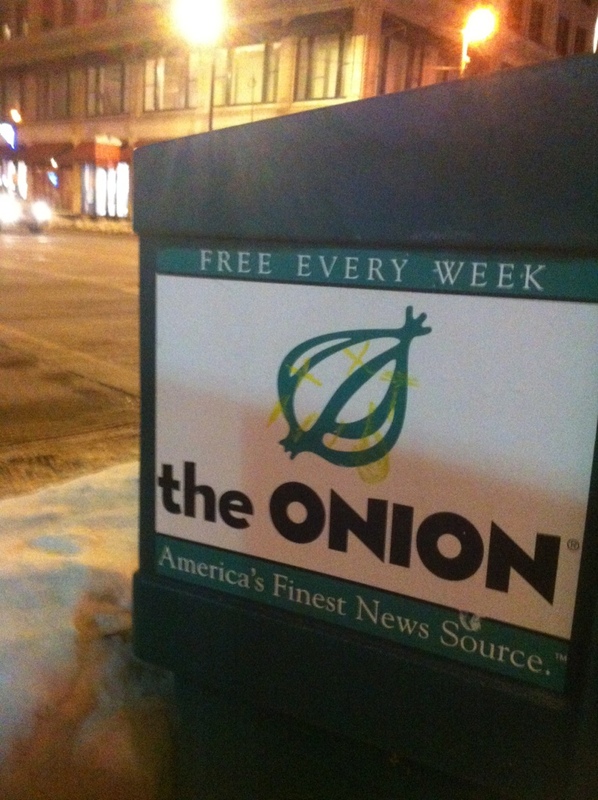 The Onion, a crowning contribution of Milwaukee to the patronage of cultural and political satire, one of the first and the last to circulate this Grade “A” American institution: The Onion print edition, gone but never to be erased from memory, at least not in the first two weeks of 2014.